In this section, we are going to study one of the important theorems in mathematics — Perpendicular Bisector Theorem. If a point is on the perpendicular bisector of a segment, then it is equidistant from the endpoints of the segment. 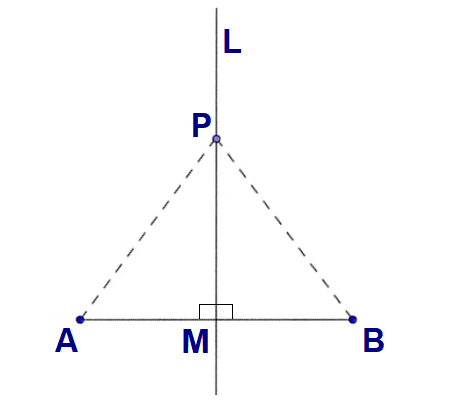 P is the perpendicular bisector L of segment AB and M is the intersection of AB and line L.
Corresponding parts of congruent triangles are congruent. After having gone through the stuff given above, we hope that the students would have understood, "Perpendicular Bisector Theorem".